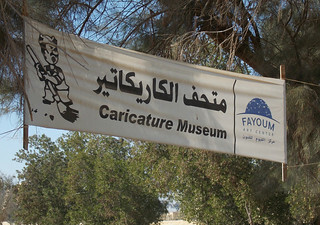 When I was exploring the area around Tunis on my laptop computer, I ran my mouse pointer along the shore of Lake Qaroun and one of the first things to pop up was the Caricature Museum - a surprising find out in this area, I thought. This project, run by painter Mohamed Abla hosts classes and resident artists from around the world in the cooler months of January and February; email him for information on upcoming workshops. 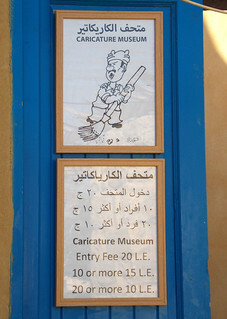 For the casual visitor, the onsite Caricature Museum holds an interesting collection of Egyptian political cartoons. 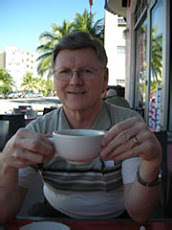 You can be sure I was keeping an eye out for the museum as we strolled through Tunis. A prominent banner marked the entrance, on a large piece of land with the museum sitting well back from the street. We approached the building and after a stroll through the gallery, we soon ran into Mohamed Abla's son, Ibrahim. Ibrahim was not particularly interested in collecting the entrance fee of $1.14 but was quite enthusiastic in his welcome. Ibrahim gave us a little background on his well-known father and the museum. 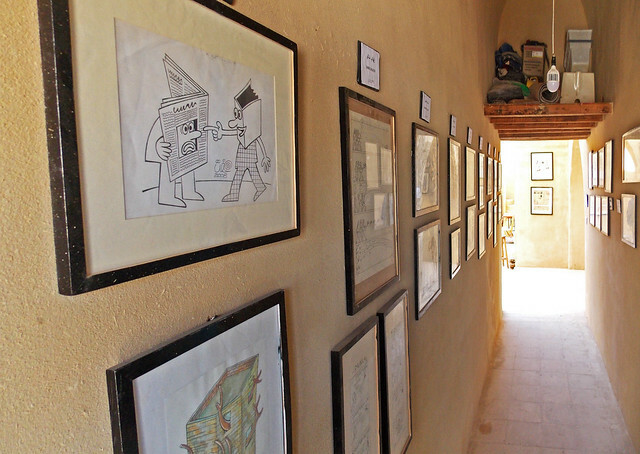 See this article in ArtSmart for a mini-bio of Mahmoud Abla and this article in Ahram Online for a full account of the Caricature Museum. A longer biography of Abla can be found here. Ibrahim invited us for tea, of course, and offered us a quick tour of the facilities where a workshop was underway. 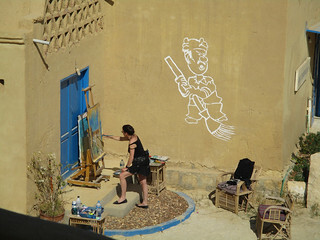 A visit to the top of the classroom building afforded a pleasant view of the lake in the distance and we noted one artist-in-residence working on a painting that incorporates the blue theme of the village. A short chat with this artist revealed that she was from Berlin. 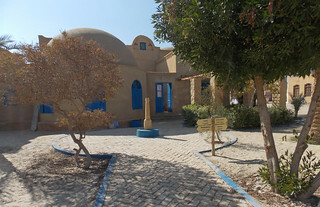 The Caricature Museum features works primarily from Egyptian publications and is probably most appreciated by visitors much more fluent than Linda and I in both the local language and politics. 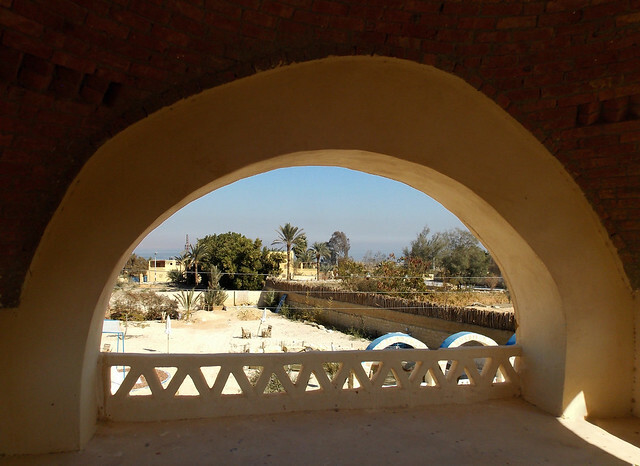 This is my final post on the village of Tunis. 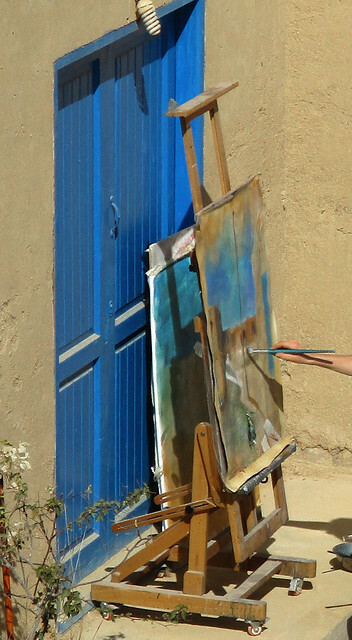 It seems appropriate to close with this link to an article in Ahram Online describing a dispute between the government and the artists in Tunis. That dispute closed the artist's facilities for a period back in May of 2017. This should serve as a springboard to the next blog posts covering urban renewal in the heart of Cairo.